I was never much of an outdoorsy girl. I was a Girl Scout, and I was OK in a tent, but really I was much happier in a hotel. And I am down with the Quality Inn and have even stayed in a Motel 6 or two in my day. I don’t need the Four Seasons (though that would be nice). However, I do love me a good campfire. My dad and I (and eventually my brothers, the neighbor’s kids, and anyone else who stopped by) used to have campfires in his backyard. I’ll tell you more about those campfires and our campfire dinner in my next recipe, which was written for Father’s Day #SundaySupper, but the whole website-hacking-cleaning-hardening things got in the way of posting it ON Father’s Day). I was such a little pyro, poking and prodding at the fire with my stick then entire time, from when it was blazing, right down to when it was just some nice red coals, and then, eventually, the white embers. I probably made my dad a little nervous, but he never let on. I had two recipes I wanted to share for Father’s Day #SundaySupper, and couldn’t decide. So I figured I would just share both of them this past weekend. But, you know, stupid hackers and stupid people fixing the site. But I still wanted to pay a little belated tribute to my dad. And the coolest thing was that my dad came over for dinner last weekend, so he actually got to try my spins on some recipes that remind me of him. Make sure you come back and check out what’s for dessert! One of the things we always had at our campfires was Campfire Potatoes. This comes from they days of my mom and dad going on camping trips with her Girl Scout Troop. 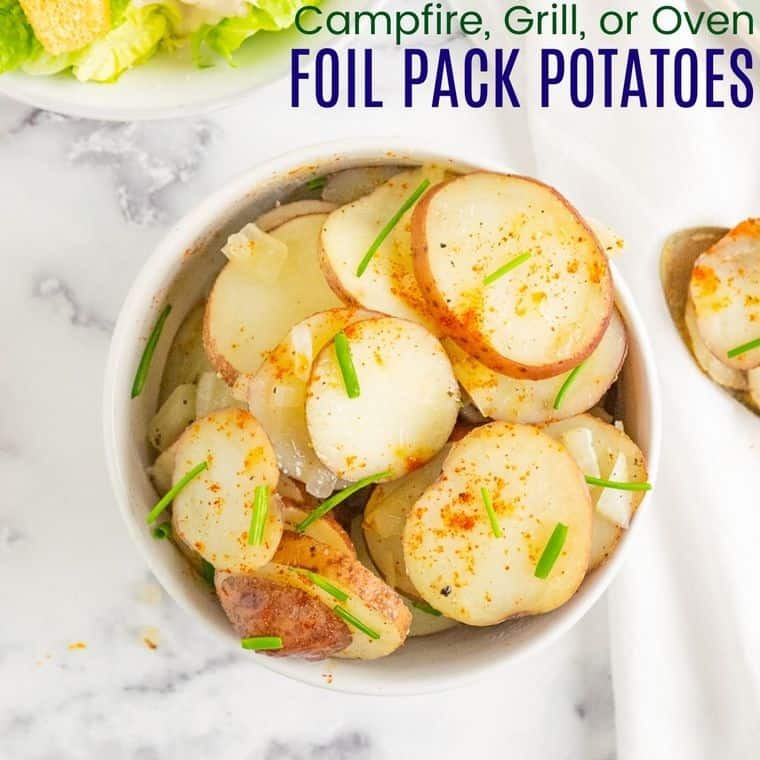 Throw some potatoes, butter, salt, pepper, and maybe a little water and some onion into an aluminum foil packet, and toss it on the campfire until the potatoes are tender. I loved the LAND O LAKES® Butter with Olive Oil & Sea Salt we used for #SundaySupper a little over a week ago, and I thought it would be the perfect way to add lots of flavor in an easy way. This butter is so yummy that it is fun to find different ways to use it. Sadly my backyard is not really optimal for a campfire, so the only other change I made to the “recipe” was to put the foil packet on the grill. Because that’s what we do. So if you are going camping this summer, or just firing up your grill, try this simple recipe, and try the LAND O LAKES® Butter with Olive Oil & Sea Salt. Disclosure: The author received a full-value coupon redeemable for LAND O LAKES® Butter with Olive Oil & Sea Salt, for recipe development and review purposes. All opinions are my own. Do you like camping? How about campfires? Start your campfire, light your grill, or preheat your oven to 400°F. Toss the potatoes, onion and salt & pepper in a bowl, and place onto a large piece of heavy duty aluminum foil, or a double thickness of regular foil that has been sprayed with olive oil or cooking spray. Cut the butter into small pieces and distribute across the top of the potatoes. Fold over the aluminum foil to form a pouch, pour in water, and seal all of the edges. 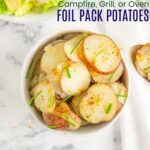 Place on the campfire, grill, or oven and cook for 20-30 minutes, or until potatoes are tender. Hi there. The current Food on Friday on Carole’s Chatter is all about favourite foods from childhood. I do hope you link this lovely one in. This is the link . Please do pop back to check out some of the other links. Have a great week. this recipe brings back fabulous childhood memories! can’t wait to try potatoes like this soon! This looks perfect for the summer! Thanks! Anything that doesn’t require heating the oven! My 20 yr old calls these Dad’s potatoes and always requests them when we cook out. I like the idea if adding the water. I will try that! I always find that without adding a little moisture, they don’t get as soft as I like them. Or they take a lot longer.